It’s a late autumn morning and all members of the day-shift team of the port Camille Rayon are in constant radio communication, sharing information in real time. Daniel Gonella, assistant harbour master, like his partner Thomas Bader, is supervising this team. It’s been 17 years that Daniel Gonella joined the team of the port Camille Rayon. After passing his vocational baccalaureate diploma (boat mechanics), and spent one summer season in the Port Camille Rayon. Daniel Gonella started working the airport and in various shipyards before coming back to Golfe – Juan after a phone call from the port management. “They offered me a 3 months’ trial during the summer season and a permanent position if all went well” remembers Daniel. The test was passed with success, as the one who started 17 years ago as a port officer was promoted assistant harbour master since 1st of January 2018. Daniel talks enthusiastically about his work. “Our activity varies with the seasons and we are constantly doing different things which is nice. Our interventions are multiple and very useful. As a supervisor of the port officers, Daniel oversees the moorings of the boats as well as the VHF radio exchange with the captains and also manages the team that cleans the port. 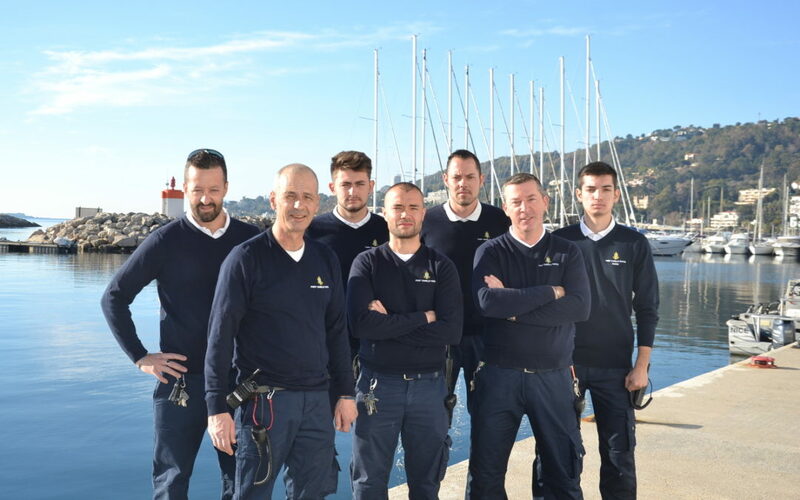 Since he joined the team of the port, Daniel Gonella, like everyone else, has followed the major changes that made the port Camille Rayon one of the most pleasant port of the French Riviera. “We took a major step on environmental issues, with the acquisition of the “seabins”; we are also equipped with 2 electric vehicles to drive around the port, and 2 charging stations for the electric vehicles. Finally, we collect cigarettes ends for the recycling.” Says Daniel; and being a part of the team who obtained the European certification “PORTS PROPRES” this year, is making him very proud. In addition to the efforts done to aim at making the port cleaner, Daniel Gonella recalls the efforts made in terms of security and communication. Indeed, dynamic message panels installed on the quays display the weather forecast and the various events organised on the port. Lastly, the assistant harbour master underlines the responsiveness of the teams, at work day and night. “We are known for the quality of our welcome and our ability to help out boaters at any time”. Daniel Gonella ( Maitre de port Adjoint ), Pierre F. – Nicolas E. – Thomas Bader ( Maitre de port Adjoint ) – Damien F. – Thierry L. – Robin G.